Video tag not supported. 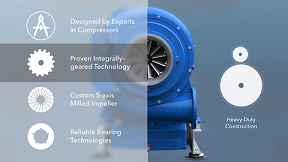 Download the video..
A summary of the advantages of Next Turbo and its product lines. Redesigned reliability. An introduction to Next Turbo and its team. See how a mechanical 2-point regulation system in a GTB compressor works and what the advantages are. Learn about the innovative items which comprises NTT's Compact Enclosure in this fun explainer video. Experience a 360 degree fly around and transparent insight into the GTB compact enclosure with GTB turbocompressor. Learn why speed control - via variable frequency drive - is not the prefered method of regulating the airflow and what are the advantages of diffuser vanes.